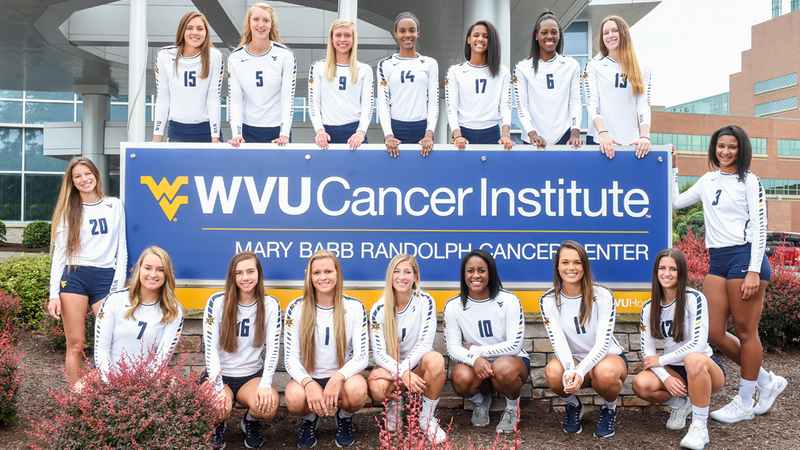 The West Virginia University volleyball team will partner with the Norma Mae Huggins Cancer Research Endowment at the WVU Cancer Institute to participate in “Set for a Cause, Spike for a Cure” throughout the 2017 season. Fans can pledge a monetary amount for each kill the team produces this season. For example, a pledge of 10 cents per kill would total a donation of $114.70 based on the team’s totals for the 2016 season. Flat donations are also accepted. The team will present a check to the WVU Cancer Institute following the conclusion of the season. WVU men’s basketball coach Bob Huggins established the Norma Mae Huggins Cancer Research Endowment in honor of his mother, who lost her battle with cancer in 2003. The Huggins Endowment Fund supports clinical cancer research and, as of January 2017, nearly $1.35 million has been raised for the organization. The Mountaineers look forward to contributing to the cause this season, as several players have family members affected by the disease. Sophomore defensive specialist Gabrielle Cuckovich will play in honor of her grandmother, who battled the disease. For more information or to make a pledge, contact the WVU Cancer Institute at 304-293-8604 or at HereToHelp@hsc.wvu.edu. Those interested in donating may also download the brochure here.